Ripe cotton fields still line the old federal road that leads to Vidalia. The bygone slave quarters have rusted over or disappeared entirely. Today, it just takes one farmer, riding one tractor, to bring in the South’s most notorious crop. But in the outreaches of Toombs County, Georgia, the onion fields are still planted and harvested by hand. When the sun rises at 7:28 a.m., I’m standing on a 37-acre field watching a team of illegal immigrants start a third day of backbreaking work. Like most of the our state’s illegal population, they mostly come from poor Mexican states like Michoacán and live in surrounding colonias united by a single tienda, or store. As tractors amble across the state to bring in the cotton, the undocumented crawl along the soft gray soil, swatting away gnats and bees, stamping my state’s official vegetable, the Vidalia sweet onion, into the ground with gloved hands. They have no time for conversation; time is money. Despite Georgia’s new look–we’re-as-tough-as-Arizona-if-not-quite-Alabama immigration law, House Bill 87, these workers are here, risking deportation and worse for the privilege of earning $2.50 for every 100 feet of onions they plant. 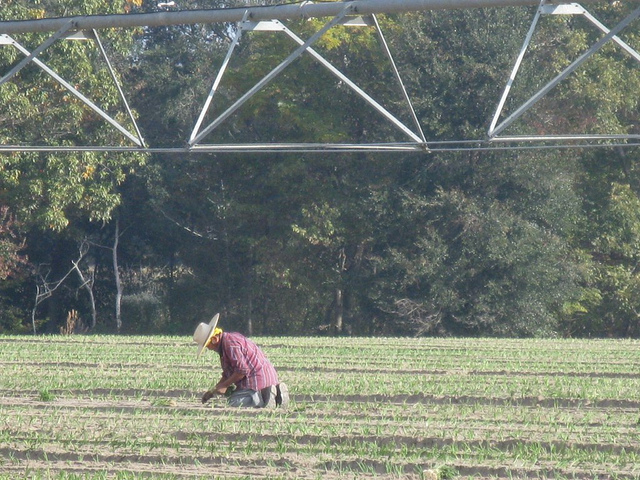 Yet for the moment, no law enforcement agency seems to mind that one of Vidalia’s 100 certified onion farmers is using undocumented labor to get his seedlings into the ground. That’s little comfort to the laborers, who view a man with a notebook and camera with the same suspicion as an unexpected late-night knock on the door. As I click a few photographs, a Mexican in a white Stetson greets me in broken English and politely asks me my business. I tell him I’m here to see the “jefe,” and he points to a far corner of the field. The farmer, who wishes to remain anonymous for obvious reasons, rides a giant John Deere tractor outfitted with GPS. It tows an attachment that plucks 83,000 holes per acre into the sandy soil. Behind him the crew leader–the man in the Stetson–steers as two men on a trailer throw bundles of freshly mowed seedlings out ahead like bricks of cash. You can smell them across the field, where on the far side, a huddle of workers–young and old–puts tens of thousands of bulbs into the myriad holes. There are two water coolers set up at each end of the field, but in the three hours that I’m here, only one young man stops to take a drink. Under Georgia’s new law, these workers would serve jail time for “aggravated identity fraud” if arrested with fake documents, but this farmer would not. He does not have to verify the immigration status of his laborers because they’re not considered full-time employees. Still, it’s not near enough labor. In previous seasons, he could expect double the hands without running a single advertisement. Like homing pigeons, workers from across the country–as far away as Michigan–would simply make their way to his fields and report for duty. Today, most of the workers come from the towns of Vidalia and Lyons, and they work from the time their children go to school in the morning to the time the final bell school rings. Others have arrived from neighboring states. When labor started shrinking en masse last spring (about the time Governor Nathan Deal signed the sweeping immigration statute, House Bill 87, into law), this farmer turned to the crew leader, a man he’s known for more than 10 years, and asked whether his wages were too low. Few, if any, workers have been deported as a direct result of HB 87 because its toughest provision–the right of police to check the immigration status of anyone suspected of unlawful activity, like driving without a license–has been enjoined by a federal judge. But the tone of the law, the message it sends, has immigrants voting with their feet. The result: In less than one growing season, Georgia farmers have lost $75 million, much of which can be attributed to a shortage of 11,000 workers. Despite nearly perfect growing conditions, thousands of bushels of blueberries, onions, and watermelons simply rotted in sultry fields across the state last spring. Earlier this fall Jon Stewart’s satirical show on Comedy Central, The Daily Show, amusingly capitalized on news of Gerogia’s farming plight by sending a correspondent down to Mexico to beg pickers to come back to Georgia. To mitigate what nearly everyone assumes will be a much steeper loss in 2012, state officials have asked prisons to identify 100,000 criminals out on probation to work on Georgia farms. Ironically, my state hopes to replace illegal immigrants with individuals who have actually been convicted of criminal behavior (crossing the border illegally is a civil, not criminal, infraction). The onion farmer just laughs when he hears that. Every season several residents from Vidalia and Lyons arrive looking for a day’s work. They are told the rate–it does not change based on skin color–but few last longer than a single day, most less than an hour. Even when they do stay, there’s no comparing the output. The Associated Press recently reported that a team of four migrant workers in Alabama–which just passed a harsher iteration of the Georgia law–can out-pick 25 American workers by 50 boxes per day. In doing so, immigrants would typically earn $150 per day, but during a recent harvesting of tomatoes, the 25 Americans each made just $24 for a full day’s work. Among the farmers in Vidalia, it’s something of a joke. For decades they’ve understood what politicians refuse to admit. “Nobody around here is willin’ to do this work,” the farmer says. Nor does he see a sustainable way to “get legal” through the government’s Temporary Agricultural Workers program, known to farmers as H2-A. In a perfect growing season, it would cost another $60,000 up front, the same amount he now spends on diesel. He would have to build housing on the land, then agree to transport the immigrants into town once a week. He would have to pay them for a fixed term of labor, no matter how many days it rains or how fast the job gets finished. There are just too many variables, like drought, rain, hail, and frost. Fertilizer costs continue to skyrocket, as does the price of freight. There is also a shortage in short-maturing onion seed, which means he would have to pay H2-A workers to stay longer than usual. The people currently working his fields would not even qualify. Instead, he would have to pay someone to recruit in Mexico or Peru, his biggest competitors, where workers plant and harvest onions the same way, but for much less money. This farmer works a mere 240 of the region’s 12,000 total acres. If forced into the H2-A program, he would have to expand production dramatically to create greater economies of scale, at a time of extraordinarily tight credit. Some big producers in Vidalia already make use of H2-A, but it requires farming many more acres to make up for the program’s inherent housing and transportation costs. Some were scared into it years ago, during the harvest of 1998, when federal immigration agents raided in broad daylight with pistols drawn. Others simply could not find enough illegals to harvest their extensive fields. This farmer does not seem too concerned with the threat of a raid. That usually only happens during the harvest. Today, timing is the real issue. He would prefer to have his onions in the ground by Thanksgiving, to prepare them for the morning frosts of December and January, but with fewer workers he’s getting more and more acres behind. He predicts it will be Christmas before the planting’s finished. That is unless he gets a windfall of labor. As we stood in the parking lot, I noticed two cars with Alabama plates that the farmer had never seen before. Immigrants are reportedly fleeing that state in droves, primarily because the Alabama law targets children. For Vidalia, it could lead to a temporary reprieve to a long-term nightmare. As I prepare to leave, the crew leader walks over and says the workers will finish the entire field before lunch. The locals want to work until the schools let out, and they need him to put more holes in the ground in a nearby field. We both crane our necks, astonished at their progress. The farmer politely excuses himself and wishes me well. Pate McMichael is a freelance writer based in Lake Oconee, Georgia, and journalism lecturer at Georgia College.